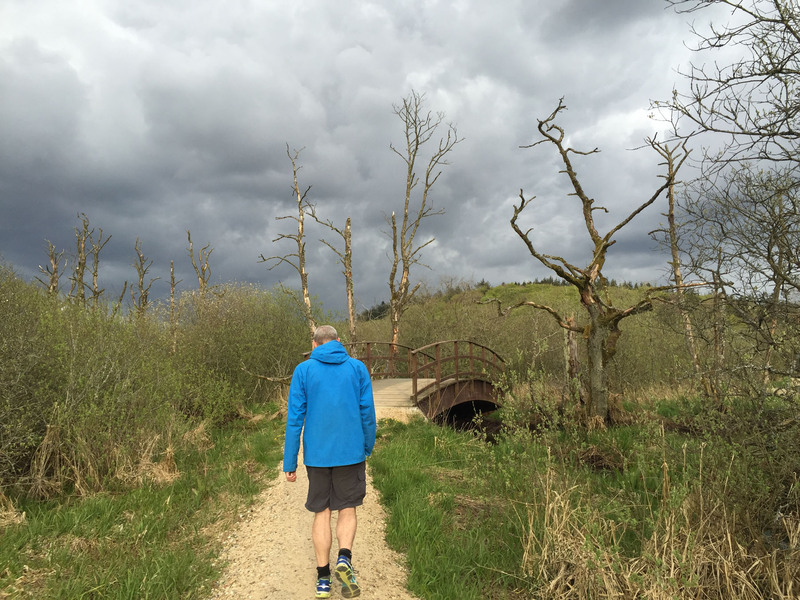 After our 3km walk around the lake in Silkeborg we had a quick walk to a local shop to pick up a few items, then we spent the rest of night in Benny, under attack from heavy rain. Large drips bounced on our roof all night, their awkward percussion accompanied by falling twigs and the occasional booming acorn, giving us a rather restless night. In the morning we drove into town and parked by the bus station. We walked the short distance into the town centre, in persistent light rain, it a fine misty drizzle but exceptionally wet. There were only a few people around and we found nothing much inspiring to see, outside of boutique and standard chain stores, but we aren’t much for shopping. We returned and sat a while in Benny hoping the weather would abate, stealing Wi-Fi from afar from the passing buses. We had planned to mountain bike in a nearby forest, but we had little desire to ride heavily churned up muddy tracks when we have no means of properly cleaning our bikes before packing them away for onward travel. Or we could be drifting into the territory of being picky, fair-weather bikers. 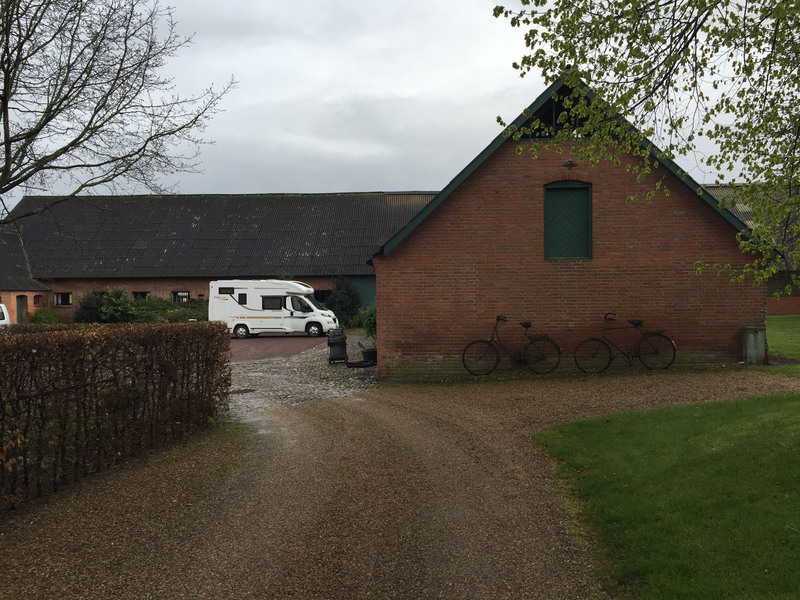 Instead we drove north-west to near Skive to stay on a dairy farm run by a friendly family of keen travellers who are happy to accept motorhomers as guests for free in their cobbled yard. The lady of the house told us of how they had experienced kindness on their travels when younger, and now wished to return the favour to others; a very noble gesture, and most welcome to us. We rested up here until the rains abated, listening to (and smelling) the cows in the nearby sheds. 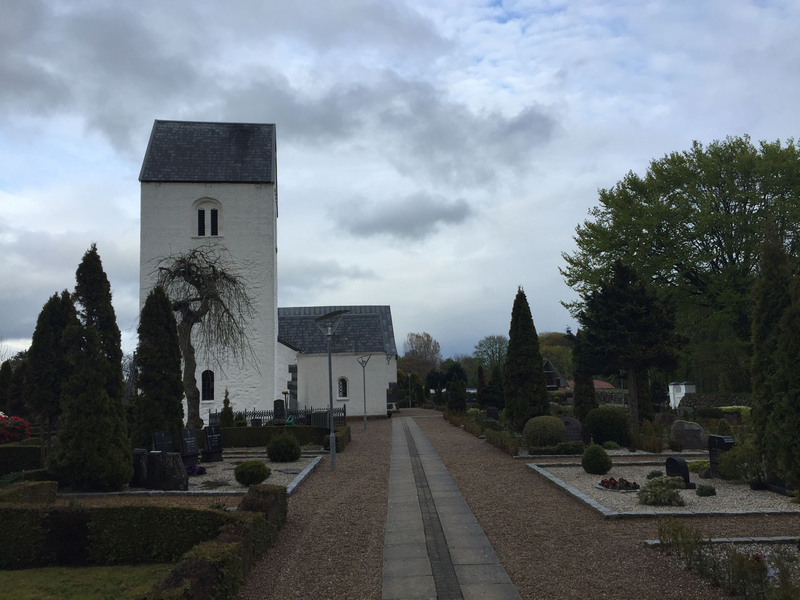 During a rain break we quickly went for a local walk, to see a lovely, tidy church with a neatly tended graveyard. From checking out the headstones, most people buried there lived long into their 90s; it must be a very healthy part of the nation. As it was a working farm we had an early wake-up call, from the constant mooing of cows from the shed opposite. We chatted with the owner again as we organised to leave and thanked her again for her generosity. 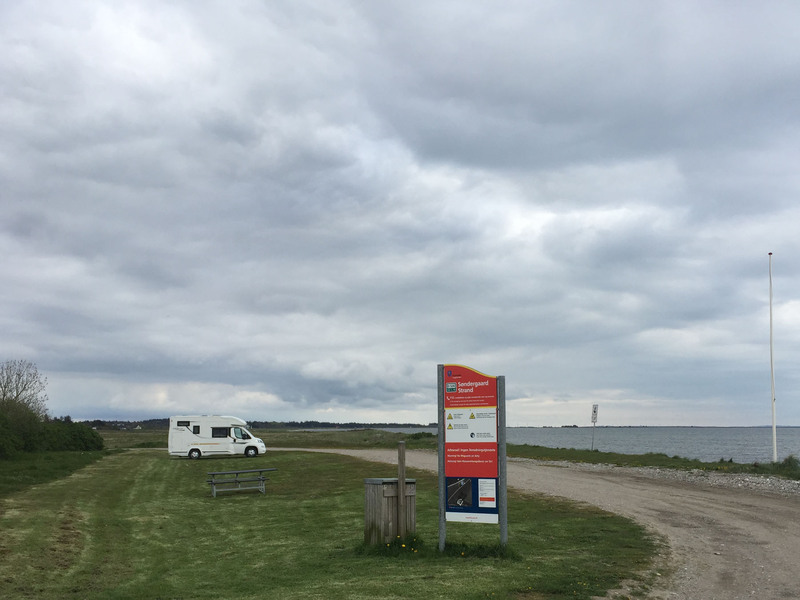 We drove north through Skive, across several large bridges joining islands to reach Thy National Park, where we stopped at Stenbjerg Landingsplads to look around the mostly closed buildings on a short street leading to the beach. 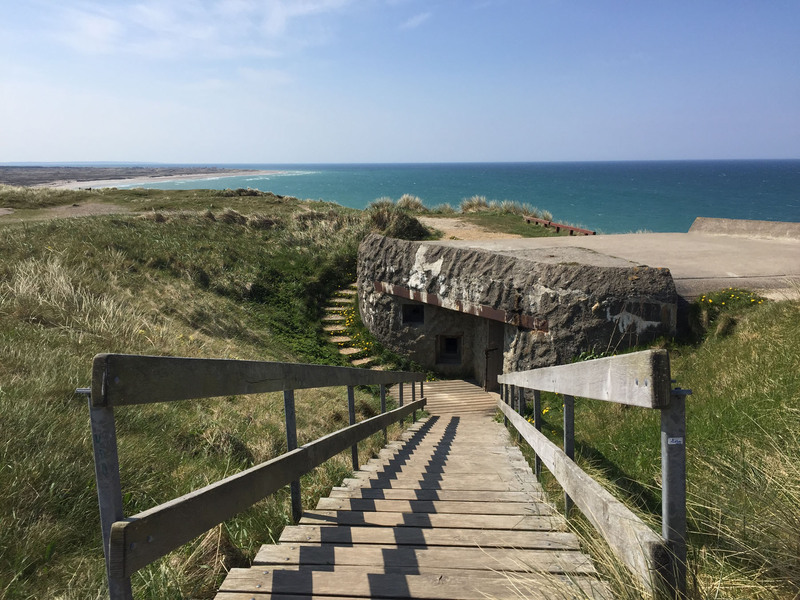 There were huge sand-drifts blown into doorways and along the street, giving the impression that the road had been abandoned for a long time, but given the strength of Danish winds this could have happened overnight. We decided to park here and cycle to another area of the National Park where we knew of some single track MTB trails through the forests. 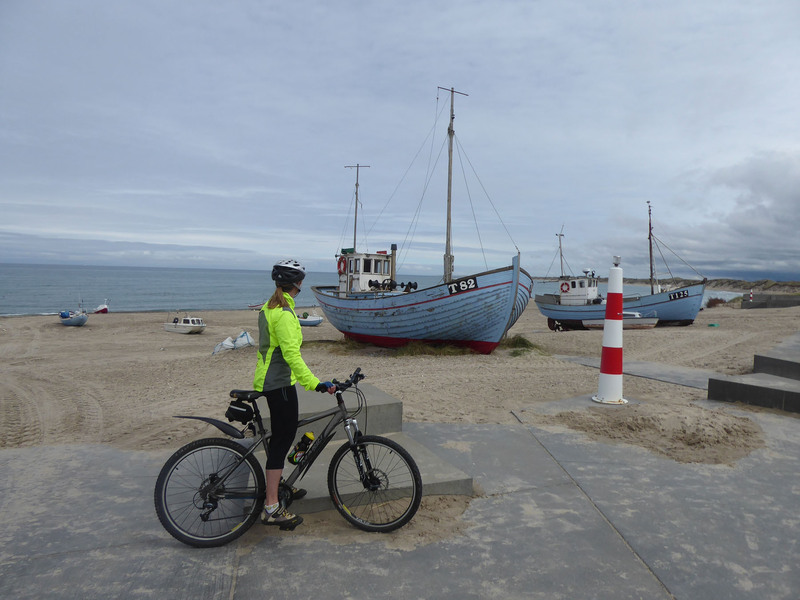 We passed through Nørre Vorupør village, where we poked our heads into the museum before we stopped briefly at the beach and marina to look at the colourful fishing boats high on the sand. The cycle path soon cut left through sandy moorland on a smooth gravel path, leading into the forest and we dutifully followed. 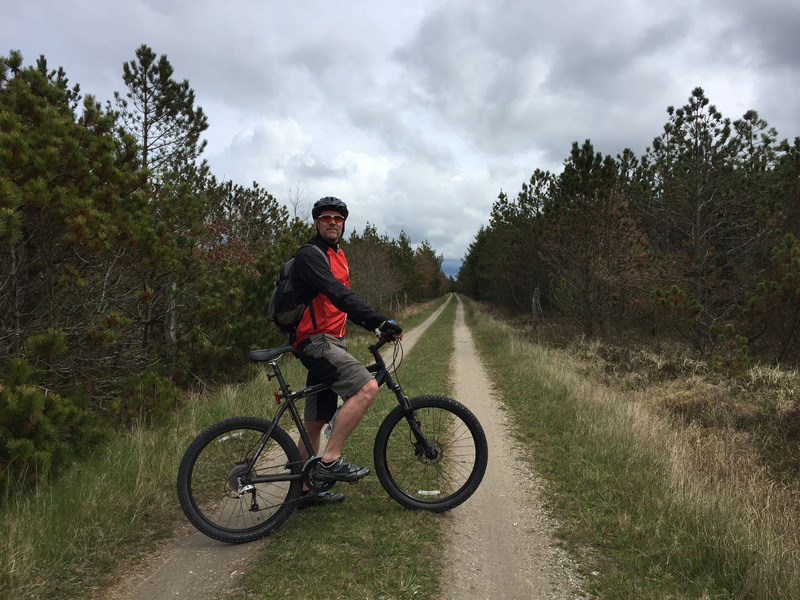 We rode on neat fire tracks for a few miles, passing small lakes and lovely ‘Nature Areas’ allowing free camping, campfires and providing mono-pitched timber shelters for cycle tourers, a hugely popular pastime in the flatlands of Denmark. The most surprising item of the day was the complete lack of others; we had the entire forest to ourselves, not having seen any other cyclists, or indeed anyone, since we turned off the road in Nørre Vorupør. 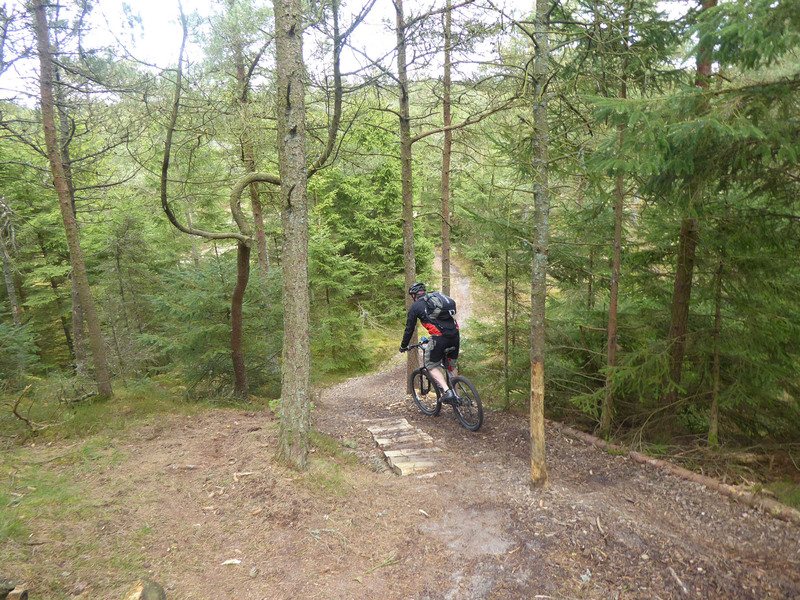 We found the MTB single track we were looking for and joined it, running over tree roots, burns and fallen pine cones. The narrow trail was built with lots of bumpy steps, steep hills, bone-shaking holes and the occasional plank bridge to cross; we absolutely loved it. The changing light in the trees as we rushed by lit up our heightened senses, with only the sound of bird calls and our groaning tyres for company. We returned, tired but happy, through the forest by different fire tracks, re-joining our outward route back near the village of Nørre Vorupør. On the way home we passed a field with a feisty, sandy-coloured horse that excitedly cantered right alongside us, head dipping and rearing, it looking so happy to have someone to run and play with; a picture of pure joy. 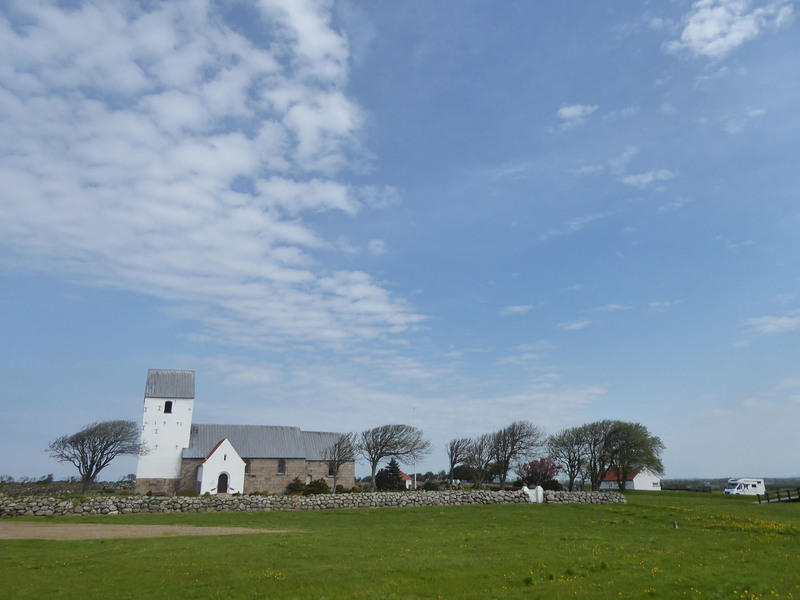 We had hoped to overnight at the lighthouse further north in Hanstholm, but found that it was having works completed and the car-park was full with construction vehicles and building materials. So we moved on, to near the small town of Oslos, where we could wild camp by the beach in a very nice grassy lay-by with picnic tables and a well-kept WC. 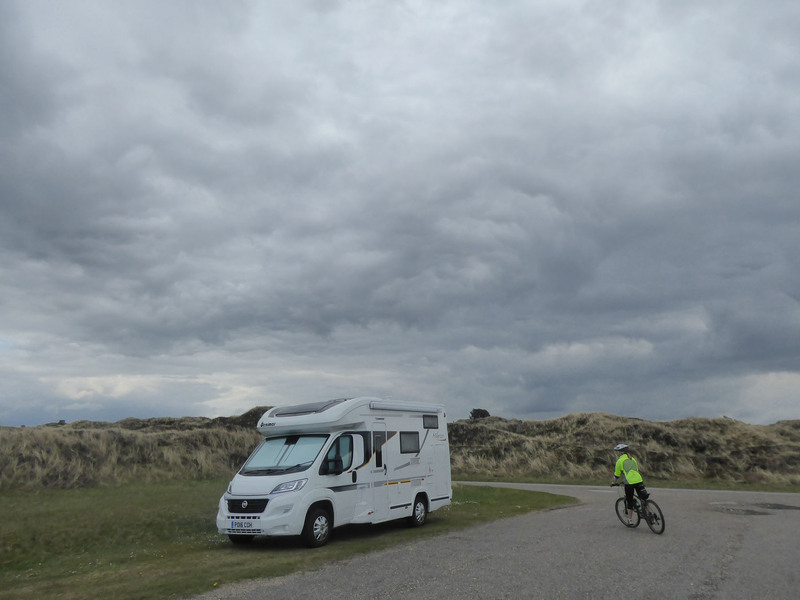 We passed a pleasant and quiet night as the only visitors on this stretch of stony beach; an ideal wild camp spot, with our own picnic table and beach frontage. The following morning we drove back north into the Thy National Park again. 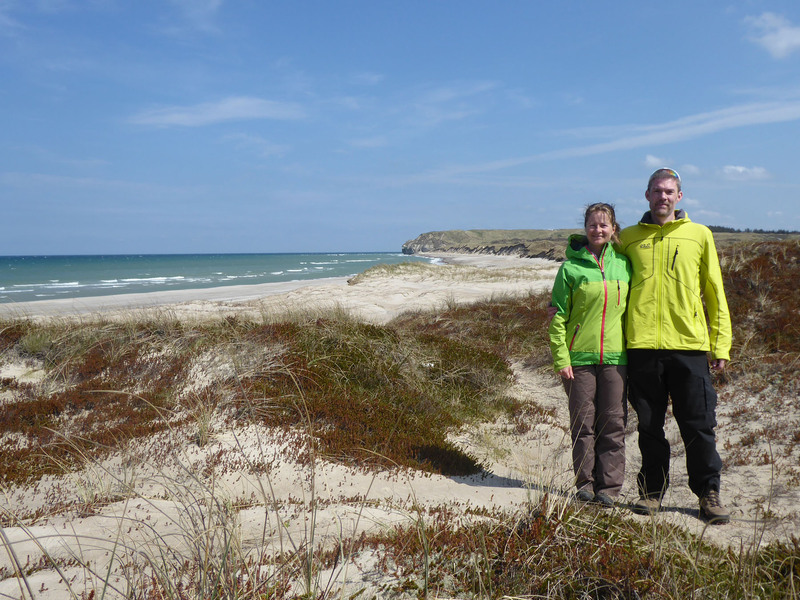 We headed first to Lild Strand where we had a brief look around the town, before retracing our steps to park up on the cliff edge near Bulbjerg. 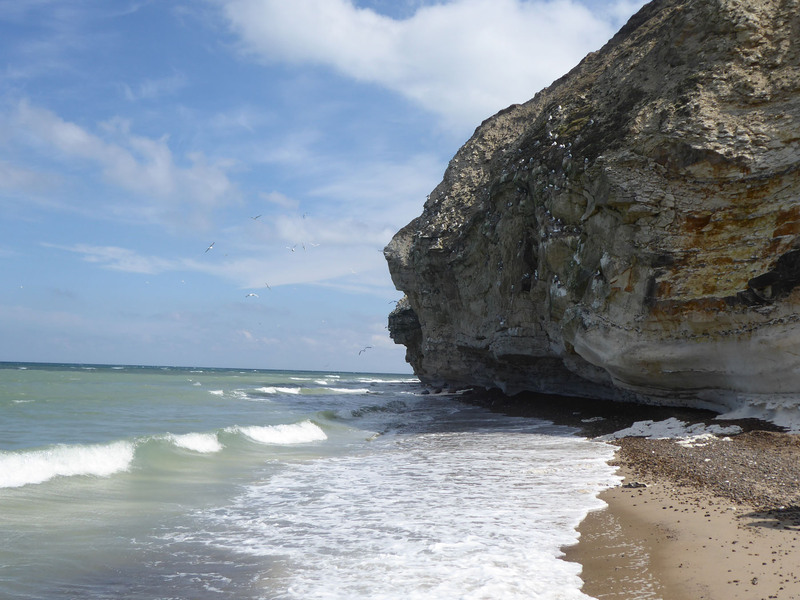 We were directly above the only bird-roosting cliff in Denmark, the sign informed us. We climbed down the timber steps on the side of the cliff to the beach, where we could see the cliff-face and the many pairs of kittiwakes that mate there. 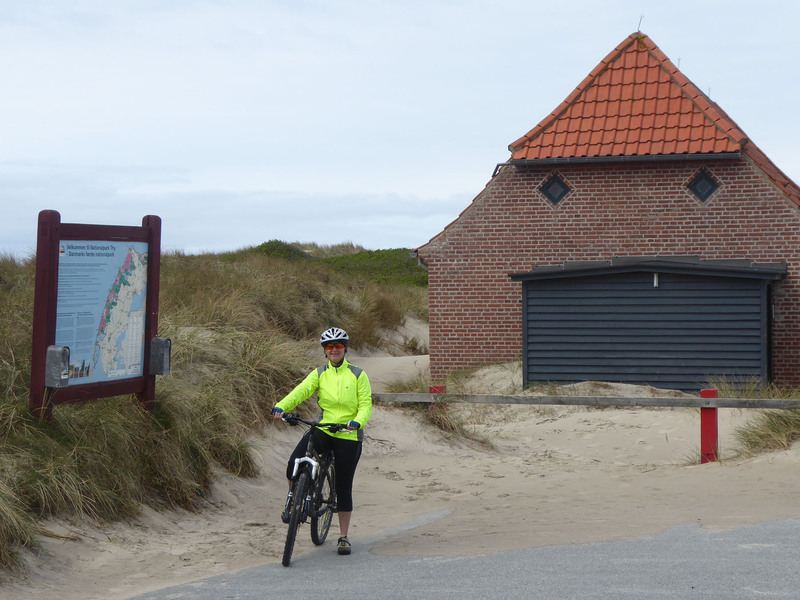 We had a long, slow beach walk along the water’s edge to Lild Strand, where we ate lunch, before returning via the dunes on a well-marked national footpath. We shared the beach with only a few others, walking their dogs. 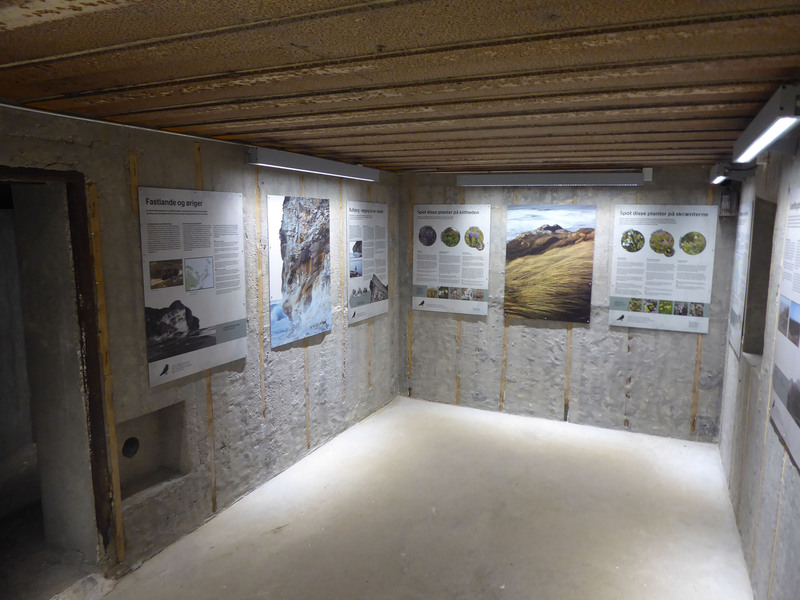 On our return we visited the Bunkermuseet ved Bulbjerg, an old German war-time bunker now utilised as an information centre with nature displays that tell the story of the complex history, geology and ecology of the local area. From here we drove to another free aire on another friendly Dane’s farm, to overnight, near the small town of Korum, not far from Løgstør. The following morning we crossed back over Aggersundbroen, the Aggersund bridge, where a few miles on we parked adjacent to Aggersborg Kirke, a typically white Danish church surrounded with wind-swept trees. We had come to visit Aggersborg’s 10th century Viking fort, the oldest in Denmark. It was constructed with solid earth ramparts in a perfect circle, complete with an external moat. The walls were made with four main gates, each on a cardinal compass point, allowing controlled entry and trade. The circle was large enough to encompass 48 timber longhouses in a symmetrical pattern, with twelve groups of four homes each set around a central, shared courtyard. From here we began making our way east, in the direction of our upcoming WorkAway hosts in Solbjerg. On the way we paused for a few hours on the outskirts of the large town of Skørping. The sun was out and the sky populated with fluffy white clouds. 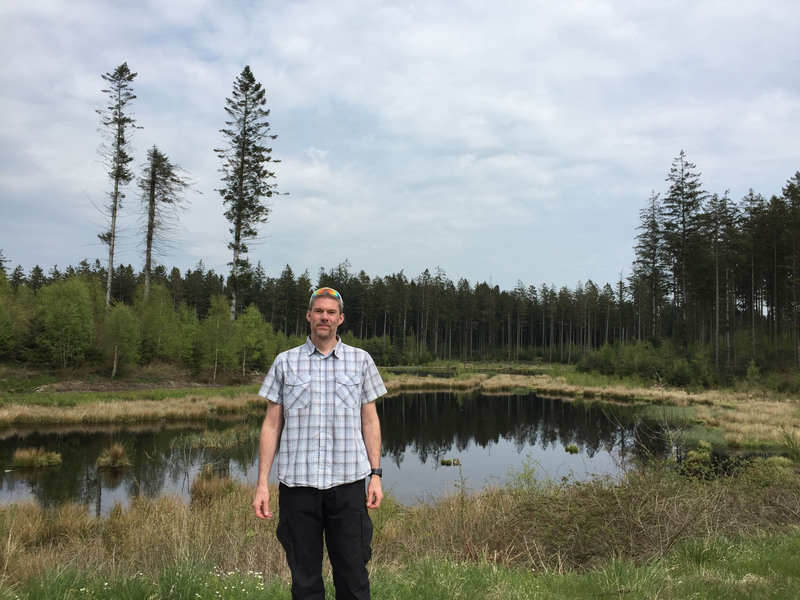 Here we had a very pleasant walk around Vedsted Skov, an area of woodland and parkland punctuated with many small lakes, located just north-west of the centre. From here it was only a short drive on to meet up with the family at our very first WorkAway, where we would be spending the coming week (or longer), helping out with all that we could. 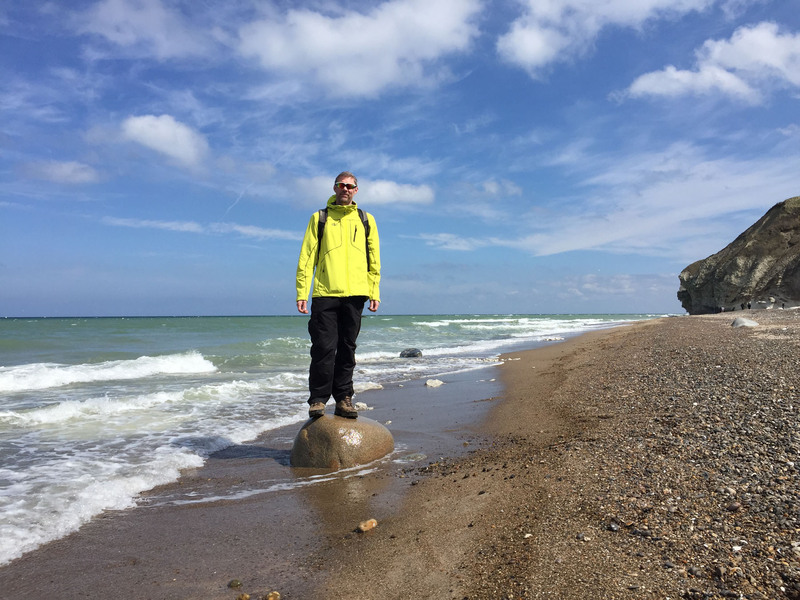 This entry was posted in 2017 Scandinavia Tour, Denmark, Hiking, In Denmark, Our Travel Journal on May 21, 2017 by Aaron Hill.